In early 2009, Ronny Hunger starts his own Studio „Comet Substance“ based in Zurich, Switzerland. 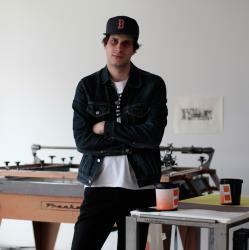 He creates hand-made posters, books and music packaging for clients in commercial and cultural fields. Great importance are given to printing techniques. Therefore, most of the projects are screen printed by hand. Forms of single elements in different styles and periods arise into a entirely new world of images, that reflect the current spirit of the time.